Sun Column, 2013 (detail). Site-specific installation for raking sunlight, with red thread, tan thread, and four brass bars, 87 x 12 x 12 in. Created for the exhibition The Dislocated Center of the Material World at the Galveston Artist Residency, 2013. Curve, 2013. Black thread and three brass bars, 96 x 24 x 24 in. Curve, 2013 (detail). Black thread and three brass bars, 96 x 24 x 24 in. Green thread, blue thread, and four brass bars, 72 x 24 x 48 in. bent hip, 2014. Blue-black thread and three brass bars, 84 x 6 x 18 in. bent hip, 2014 (detail). Blue-black thread and three brass bars, 84 x 6 x 18 in. Site-specific installation for raking sunlight, with red thread, tan thread, and four brass bars, 87 x 12 x 12 in. Created for the exhibition The Dislocated Center of the Material World at the Galveston Artist Residency, 2013. Sun Column, 2013 (alternate view). Site-specific installation for raking sunlight, with red thread, tan thread, and four brass bars, 87 x 12 x 12 in. Created for the exhibition The Dislocated Center of the Material World at the Galveston Artist Residency, 2013. Installation view of "Jonah Groeneboer: Blue Shift" at Platform Centre for Photographic and Digital Arts, Winnipeg, 2015. Photograph courtesy Platform Centre. Turquoise / Magenta, from Blue Shift, 2015. Oil on linen painting and fiber-based silver gelatin print, 14 x 24 in. Blue / Green, from Blue Shift, 2015. Oil on linen painting and fiber-based silver gelatin prints, 14 x 24 in. Pale Pink Yellow / Pale Magenta Blue, from Blue Shift, 2015. Oil on linen painting and fiber-based silver gelatin print, 14 x 24 in. Red / Fuchsia, from Blue Shift, 2015. Oil on linen painting and fiber-based silver gelatin print, 14 x 24 in. What does it mean for an artist to make works that are hard to see? As viewers, we cannot help but feel that decision’s effects. One questions if one is looking at or for the right thing. Incriminations emerge. Some viewers ask why the work cannot just reveal itself better, while others search themselves for ways to look more intently, scrutinizing every detail for incident, event, and evidence. Such frustrations and compensations arise because of our faith in seeing. It is hard to realize that your ability to see cannot fathom all that appears. But that does not mean one should not work to see. Rather, such visual art and its refusals ask us to consider the ethics of sight—sight that we are reminded is limited rather than imperious. Jonah Groeneboer’s work takes as a central theme the ethical contours and political ramifications of attempting to see as a way of attempting to know. His works are hard to see. They are impossible to photograph. They make demands on the viewer. At first appearing straightforward in their geometric simplicity, they reveal their formal complexity slowly, partially, and successively. Groeneboer adopted the look of 1960s American Minimalism, extending its activation of perception as a means to address the body.1 Minimalism, to offer a hopelessly brief formula, emphasized formal reduction to geometric units as a means of creating more unified, direct objects that—in their simplicity and regularity—compelled the viewer to attend to their processes of perceiving. Minimalism’s long-lasting impact can be understood to derive from the ways in which it activates the space of the gallery and the viewer’s place in it, and artists have subsequently expanded on its terms and tactics to similarly engage the viewer’s relational co-presence with the object in space. Groeneboer’s work draws on but does not replay Minimalism, even though his sculptures and paintings might at first look like those of Fred Sandback, Ad Reinhart, Jo Baer, Brice Marden, or James Bishop. His work departs from these precedents, however, through its flirtation with invisibility, through its requirements for the viewer to see, and through its quiet insistence that vision’s highest stakes are revealed when one attempts to regard another person. In its particular activation of the struggle to see, the other key comparison to Groeneboer’s practice is that of the Swiss sculptor Alberto Giacometti, whose post-World War II works took the impossibility of fully seeing a person (even one as close to him as his own brother) as their recurring theme. Giacometti’s attenuated statues and portraits teach us about the difficulty of encountering the opacity of another person, and they remind how external features allow only a partial view of another’s subjectivity. A central mode of practice for Groeneboer has been his use of thread to create complex transparent geometries in three dimensions. These subtle sculptures evoke bodies and persons despite their extreme abstraction. 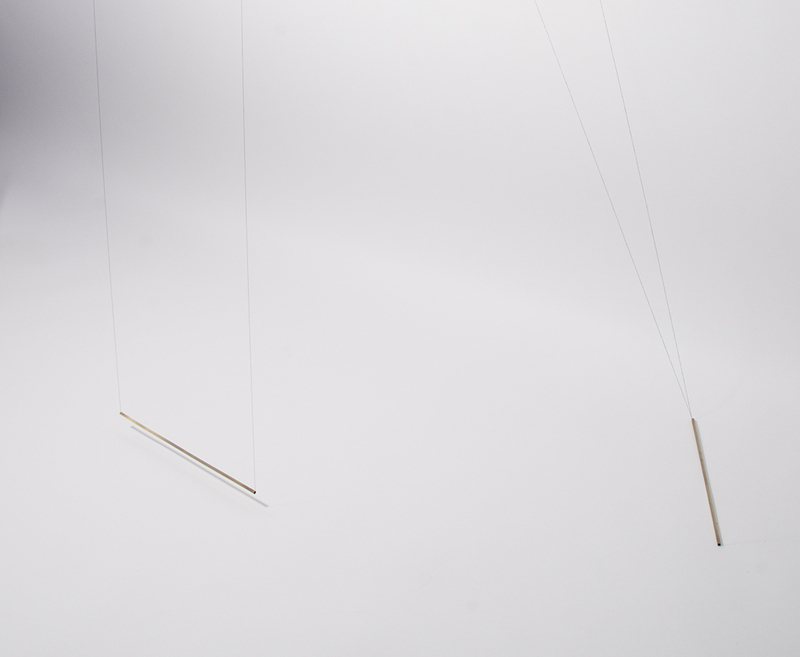 With delicate threads suspended from the ceiling and made taut by hanging rectangular brass rods, Groeneboer’s sculptures exhibit an animated stillness as they almost imperceptibly vibrate in response to microclimatic changes of the room. The rods lend width to the shape made by the threads that pass through them. Some of these rectangular brass tubes hover just above the ground, while others are planted on it. Like Robert Barry’s similarly suspended works, the existence of the nonvisible but bodily pressing force of gravity is distilled as a reminder to the viewer. While the hovering rods of Groeneboer’s works produce their regular geometries through responding to gravity, their complex and non-regular planes are made possible when the rods resting on the ground are placed at angles to that plumb. With titles that evoke bodies and actions such as bent hip and The Step, the works invoke but do not image the human form and its capacities. Some of these works take on the proportions of humans when their hanging rectangular planes approach the dimensions of full-length mirrors. In this way, they face us with a verticality historically associated with statue. They are astonishingly complex, however, in their refusal to let their contours define mass or solidity. The works appear distinct and different from every angle of approach as their faintly outlined geometries multiply and interpenetrate. It takes time to visually disentangle the taut lines from each other. Forms that had at first been seen as simply rectangular transform into complex, torqued planes. This multiplicity demands circumambulation rather than visual circumscription, and Groeneboer’s works stage visual transitions at every turn. It is hopeless to try to capture this experience in a photograph. This is the intentional effect of Groeneboer’s activation of visual discernment. Unlike, say, Sandback’s thicker, colored string that often creates the illusion of architectural elements or blockades, there is an intimacy to Groeneboer’s thinner thread as it escapes being seen from a comfortable distance. It requires work for the viewer to view, and the act of seeing becomes muscular in its intensity and resistance. Because of the almost immaterial and invisible presence of the thread-lines, one simply cannot focus on the work as a whole. The thinness of the thread suspended in our space dissolves into its environment. The background of the room competes with the taut lines for our vision’s attention. The threads oscillate in and out of focus, and the viewer must constantly strain to recapture these slight lines that subtly vibrate in space. This is even the case when Groeneboer uses colored thread, as in his site-specific work Sun Column that was made to respond to the strong raking Texas sunlight streaming across at different angles throughout the day. Here, the combination of intense light (a condition of that space and that geography) was used to play with successive appearance and disappearance. Even in the moments of brightness in relation to the colored thread, however, the extreme thinness of the thread vexed viewers’ ability to focus (and remain focused) on it before the sun’s activation of the color changed or passed. Groeneboer uses the slightness of thread to slip away from easy visual consumption and stability. Like Giacometti’s receding faces and attenuated statues, the outlined form’s expected wholeness sweeps away with the intense focus demanded in order for us to see what is directly in front of us. The experience is durational, with these lines in space requiring the viewer’s proximity and ongoing effort in order to be seen. Even though their verticality reflects the viewer’s, the thread works can disappear before the viewer’s eyes as soon as focus shifts away to another point. We must continue to work to see because of the thread’s almost complete lack of mass and the ways in which it visually enmeshes into all that surrounds it. Ultimately, Groeneboer offers the viewer a proposition: walk away with nothing or do the ongoing work to see that which is in front of you on its own terms and in its full complexity. That complexity frustrates the presumption that recognition is simple, immediate, and in the viewer’s control. Instead, the work’s material form requires vigilance in order to be seen. There is sophistication in its refusal to be easily legible while nevertheless being, in its form and concept, open and transparent. Remember, unlike many of Sandback’s barriers and walls, these are human scale, and the geometries and twists of the outlined forms in space evoke bodies and actions.3 Like the mirrors with which they share proportions and verticality, Groeneboer’s thread works face us when we look at and through them. They confront us, however, with a form that is not easily apprehended visually and that takes ongoing commitment in order to see. Most viewers will never see these works under those moonlit conditions, however. Instead, they are confronted with the initial paintings’ divided hues while being reminded that these works appear differently elsewhere and at different times. The ability to have a direct visual experience in the moonlight is off-site and out-of-sight. In this, the works draw on legacies of conceptual art in which the idea, rather than a visual encounter, predominates over the visual experience. While it was not a reference for Groeneboer, I think of other impossible-to-see works like Sandback’s 1969 Eight-Part Sculpture for Dwan Gallery (Conceptual Construction), in which the artist declared that there were volumes of gasses such as helium and xenon just above the gallery’s floor or, more directly, like Barry’s inert gas sculptures in the desert. 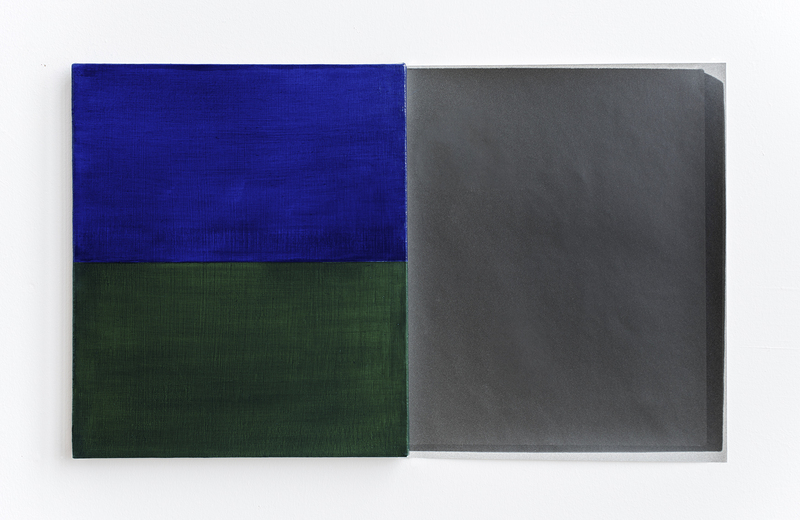 Groeneboer’s Blue Shift paintings similarly remind us of what we are not able to see here. Importantly, however, Groeneboer does not leave the moonlight conditions of viewing completely apart. Instead, he has organized the works as diptychs of two portrait-oriented rectangles. The diptych format has powerful consequences. It is used by artists to establish parallels and comparisons, compelling the viewer to stitch together both similarities and differences across the central divide. For Groeneboer, this meant pairing the initial painting with a photographic print of the works under the conditions of moonlight. At first appearing as simple or approximate monochromes, these photographic prints also show a subtle shadow along the far edge. This is the shadow cast by the moonlight on the painted object at the moment it was photographed. Groeneboer’s decision to place the initial painting on the left or the right side of the panel is determined by the direction of the shadow cast on the night when each photograph was taken. The experience of seeing under the moonlight is thus partially recreated, but Groeneboer also includes this as a reminder of each photograph’s mediation and temporal distance. The shadow, that is, points to the fact that the photograph was taken in a different place, at a different time, and under different visual conditions. Each diptych does not result in the same monochrome from one to the next. This is due to the differences between the human eye and the camera. In the moonlight, these color combinations will appear as monochrome to the naked eye, but the camera has different abilities in those lighting conditions. So, works like Pale Pink Yellow / Pale Magenta Blue retain their bisected form in the photograph because the camera could not capture the in-person visual experience. Cumulatively, such variations in the works in the Blue Shift series point not to a singular conceptual operation but rather to the tenuous and limited ability of the photographic print as a means of conveying the actual experiences of seeing in moonlight. Like the thread works and their resistance to focus, the Blue Shift works problematize seeing as a way of knowing what’s in front of us. The mode of compare-and-contrast that results from the diptych format compels us to reflect on our vision’s limitations and partiality in this situation. We must grapple with the actual visual encounter with the object being paired with a representation of how it could otherwise be. Merely looking is not enough, and we are told we would need to work to see more adequately and more completely. We would need to commit the time to the work to go to another place and see it at another time. Each bisected panel could appear differently under the right conditions, and we could see that if only we committed to seeing the paintings in another light. On the eve of first drafting this essay, I was having dinner with a painter I respect who had some years ago turned away from abstraction. One question that was raised in our conversation was about the problems faced by reductive abstraction in particular. He saw it as questionable when abstract works began to look similar and when their politics relied on external explanations or information provided by the artist. Shouldn’t it, he asked, be made immediately visible in the work? I understood his point (which was sympathetic rather than antagonistic), and he was expressing concern that politics became illegible in abstraction. He worried how very divergent works started to look alike to the point where message or conviction would be hopelessly bracketed and subjective. One might at first assume that one could make this claim about Groeneboer’s practice, and it would not be hard to list works by other artists with which we might confuse his at first glance. This pseudomorphism (as the art historian Erwin Panofsky called resemblances produced from divergent priorities and contexts) could lead one to believe that Groeneboer’s sculptures or paintings are interchangeable with those of such different artists as the Minimalists mentioned above (or other, more contemporary, artists using reductive abstraction).6 Nevertheless, Groeneboer’s work is not the same as these other examples that it might at first look like. He arrived at geometric abstraction because it allowed him to address bodies and persons without imaging them, and he does not aim for the pragmatically verifiable geometric object, as many Minimalists did. Rather, he uses the ostensibly simple form to complicate the presumed equation of seeing and knowing. The difference of Groeneboer’s practice becomes apparent only slowly after one spends time with his works and gets to know the particularity that their simplicity belies. This is also the case with the political and ethical underpinnings of Groeneboer’s work, which are, like his objects, hard to see easily or immediately. This refusal to instantly self-disclose is intentional and strategic. In this regard, we might understand some viewers’ fears about resemblance or pseudomorphism differently. Rather than the dilution of difference or particularity, resemblance can also be the result of deliberate choices to complicate similarity and to demand that seemingly identical or typical appearances be committed to and considered on their own terms. An important resource for Groeneboer’s work has been the politics and history of transgender experience, and it is from this perspective that one can see how such supposedly formal and descriptive terms as resemblance and identicality can be understood to be politically urgent. For Groeneboer, the questions of the viewer’s share and the process of perceiving are not simply neutral arenas for the artist to activate. They are also the terms of interpersonal negotiation and sociality, and from these Groeneboer distils visual discernment into formal relations. In his work, there is an account of personhood and its ethics proposed by simple forms that nevertheless escape being apprehended comprehensively through sight. Whereas the Minimalists often used formal reduction to achieve clarity, specificity, or universality, Groeneboer leans on those same formal traits to resist and to question the presumption that things (and persons) are only as they first appear. A central theme in transgender history has been the question of appearance in the visual field—that is, how quickly appearance is used to ascribe assumptions about gender onto persons. Groeneboer’s work is aligned with other artists working today who are pursuing abstraction as a means to address transgender experience and to resist the taxonomies through which bodies are read and personhood is assumed.7 Abstraction becomes a way to discuss social relations and bodily politics without producing an image of a body. In this way, there is a refusal of the voyeurism and scrutiny that so often hounds the representation of the transgender body. As a mode of resistance, Groeneboer’s work offers an account of intersubjectivity that, like Giacometti’s, upholds the inscrutability of another person. The concision of Groeneboer’s work is poetic and political, for it addresses sight as the matrix in which arbitrations of personhood are performed. For instance, his thread works stand up to the viewer’s vision and remind how limited and inconclusive it can be. This performance of resistance to immediate visual comprehension draws its urgency and energy from the experience of daily confrontation with others’ sight and with their compulsion to read and to decipher gender.8 A person’s lived experience of gender does not always match others’ visual categorization of that person’s appearance. As well, those who have transformed their bodies and appearances to visually convey the gender they know themselves to be must constantly negotiate others’ sight and scrutiny. Visual taxonomies of gender weigh on us all, but their oppressive force is particularly felt by transgender subjects who exceed or who complicate those regimes of visual interpellation. Groeneboer engages with these issues in artworks that perform modes of visual resistance and that demand commitment as a way of knowing particularity. As with his thread works’ vexation of vision, for instance, the seeming simplicity of the Blue Shift panels quickly dissolves as we realize that we are not seeing under the right conditions. What is in front of us can only be seen incompletely. That is, the Blue Shift works stage their own nonvisibility, despite the ostensibly straightforward geometric form. The two halves of the diptych always push us off-stage and off-site to the elsewhere moonlight place where this painting appears differently. Again, merely seeing (or seeing quickly) is inadequate and incomplete. To further pursue how these issues are enacted in the formal and conceptual dynamics of the Blue Shift works, it should be emphasized that the diptychs are not made up of two equal halves, but rather two states of the same work. The “original” (just because initial) bisected painting is obdurately present on the wall next to a successive image of it. We are confronted with an image of transformation, with one side of the diptych being the ground from which the other’s image was subsequently made. The representation of the painting—in the monochrome side—thus encodes distance and duration. Remember, we see what the divided painting can be under different conditions and at a different time, but we only see it in the form of a photographic approximation of what that experience would be like. Were we able to see the painting under the moonlight, our view would again be partial (since we would lose the variability within the painted panel). There is no comprehensive or total viewing experience; there is only a work that appears differently in its possible conditions of being seen. The diptych format emphasizes this potentiality and partiality in its staging of the relationship between the daylight and the moonlight, between the here and the there, and between the now and the when. That is the odd nature of the approximate monochromes in these works. They represent another state and remind the viewer of how their vision is inadequate and partial under these (and, indeed, all) conditions. They point to how we might and must try to see otherwise. All of this is to say that viewing the Blue Shift works in a white box gallery is intentionally an experience of incompleteness as well as an encounter with multiple resemblances. We are reminded how everyday looking fails to show us what lies within. Groeneboer could have just told us that the moonlight would work, but he generously went further by pairing the paintings with these monochrome or near-monochrome prints, showing us the mere representation of the ways in which we could actually see if we were to make the effort to see his paintings in their ‘proper’ light. Moonlight is, after all, associated with transformation, as we are told from Shakespeare to popular culture. We see just an image of what this transformation might be like (in the photograph of the painting in the moonlight), but even this is incomplete since the camera’s eye captures more than our own can. Because of this, these are not the complete monochromes we would see if we were in the moonlight, but rather something just close to that experience. The photographic panels, that is, do not offer finality but rather, like the diptych as a whole, perform the distance between our looking at the works and the conditions in which they could be seen otherwise. The variety among the monochrome representations is, in this light, important. The Blue Shift works, at first, all look alike but reveal their particularity slowly the more one sees and differentiates them. Their variations from one to the next can also be understood to evoke the slow visual transformations that would occur if we were in the moonlight with them and watched the shifts in light’s intensity from moonrise to moonfall. 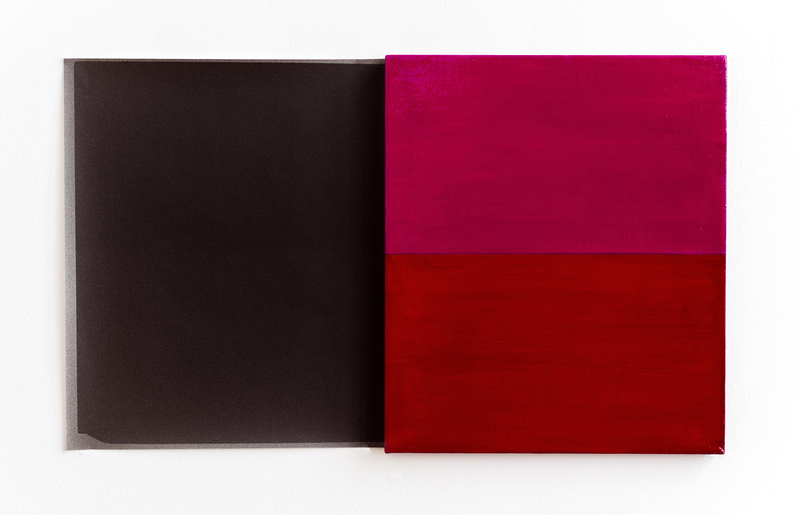 In this way, the relationship between the diptychs comes to evoke the optical shift possible in the works’ constitutions as well as it reminds that these visually similar works also slowly reveal their particularity in response to committed looking. Like the thread works, the onus is on the viewer to do the work in order to see properly. No way of looking is comprehensive or immediate—even for such a simple thing as rectangles on a wall. With Groeneboer’s works in mind, I would now respond to my friend’s challenge to reductive abstraction that there can be a politics—a specific politics—in resemblance and in the refusal to make difference easily legible and, consequently, open to surveillance and scrutiny. The belief that artworks should immediately play out their politics as visibility must be interrogated for the ways in which that belief relies on a compulsory self-disclosure. This is different from saying that the experience or politics on which an artist draws should be camouflaged, hidden, or suppressed. It is saying that there are political, personal, and ethical bases for art (and life) that choose not to offer themselves up easily to the viewer for visual consumption and instant categorization. Groeneboer’s works remind us that there is an ethical and political basis for the refusal both to self-disclose and to be made simply and readily visible. Disclosure and particularity come with the viewer’s on-going commitment. The visual terms of his work show us that the recognition of the unique qualities of the individual are earned through the establishment of intimate, durational relationships. Being hard to see or looking alike can be politically powerful and necessary, and Groeneboer makes this claim with artworks that vex visual comprehension and that demand time and dedication. The ethical aspects of vision’s role in interpersonal relations are thematized in Groeneboer’s objects themselves, which complicate our belief that merely seeing is fully knowing. Instead, his artworks ask us to commit to the effort required to regard persons on their own terms. I would like to thank Jonah Groeneboer for the many conversations and correspondences over the past few years that have informed my writing about his work. This essay was initially occasioned by the 2015 exhibition of Groeneboer’s Blue Shift works at the Platform Centre for the Photographic and Digital Arts, Winnipeg, and I am very grateful to the staff of Platform for their assistance and encouragement. All images © Jonah Groeneboer, 2016 and courtesy of the artist unless otherwise noted.